Devoted to the Emancipation of Mind, the Elucidation of Vital, Mental, and Spiritual Phemonena, and the Progress of Man. 1851—1853 Quarterly, then every other month, then monthly. Brittan (1852-1853) was a Universalist minister who had early on entered the ranks of the “Harmonialists,” the devotees of the revelations of Andrew Jackson Davis, and then edited the group’s journal, The Univercoelum, until he broke with Davis over the latter’s affair with a married woman. See the note under The Univercoelum. After several short-lived publishing ventures of more general interest, Brittan began the Shekinah, which he largely wrote himself. The journal devotes considerable space to the new phenomenon of spiritualism, but is really the record of Brittan’s lucubrations on the nature of man and God. The journal also featured the poems of Thomas Lake Harris, another of the circle around The Univercoelum, and is notable for its illustrations and for the inclusion of music. Brittan originally published the journal alone, probably with money borrowed from Charles Partridge, but Partridge formally became a co-owner in May 1852 (See “New Arrangement,” Spiritual Telegraph, September 18, 1852) and the journal thereafter was published by Partridge & Brittan. 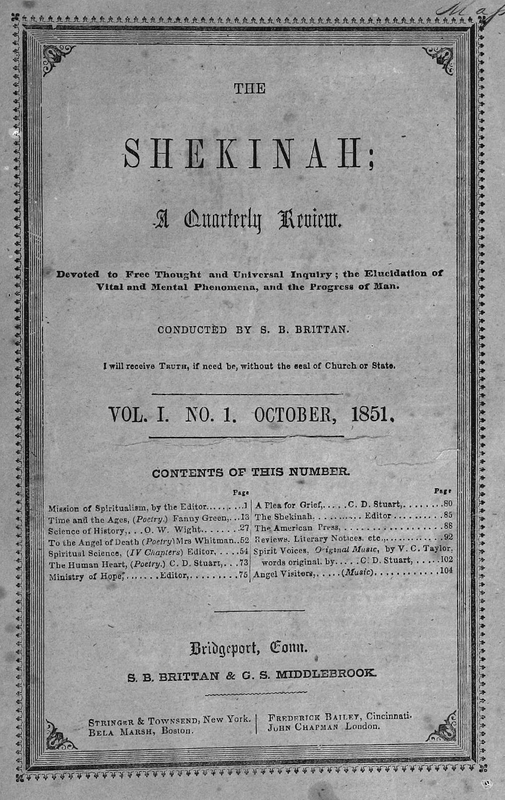 In partnership (or individually after the firm was dissolved in 1857), Partridge and Brittan, alone or in partnership, also published or edited the majority of the important spiritualist journals of the 1850s and later: The Univercoelum and Spiritual Philosopher (1847-1849); The Shekinah (1851-1853); The Spiritual Telegraph (1852-1858); The Telegraph Papers (1853-1859); The Sacred Circle (1854-1857); Tiffany's Monthly (1856-1859); The Spiritual Age (1857); The Spiritual Telegraph and Fireside Preacher (1858-1860); The Banner of Light (1859-1860); The Present Age (1868-1872); Brittan's Journal (1873-1874). Connecticut Historical Society; Amherst College; Brown University; LOC; University of Texas, Austin. MD Note: In the volumesb> below, we are seeing the Shekinah "Papers," rather than the original serial. Brittan had a habit of recycling periodical material and republishing it in book form; he did this, for example, with The Spiritual Telegraph, recycling longer essays from the original serial into The Telegraph Papers, and stripping the material of its original provenance, arrangement and context in the process. The serialized issues which precede the volumes represent The Shekinah in its original form.